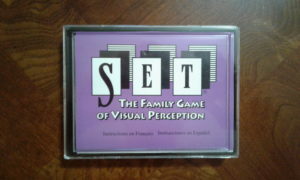 Set is a card game developed by Marsha Falco and published by Set Enterprises, Inc. and Cannei, LLC. It was released in 1991 to understandable acclaim, as it is a clever, novel card game. Set may be played solitaire, or with any number of players provided there is enough space around the table for everyone to see what cards are in play. There are 81 cards in the Set deck. 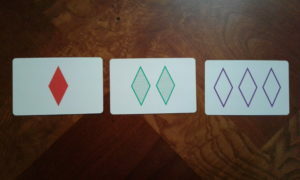 On these cards are combinations of one, two, or three shapes in the form of a squiggle, diamond or oval. These shapes appear in one of three colors: purple, green, or red. 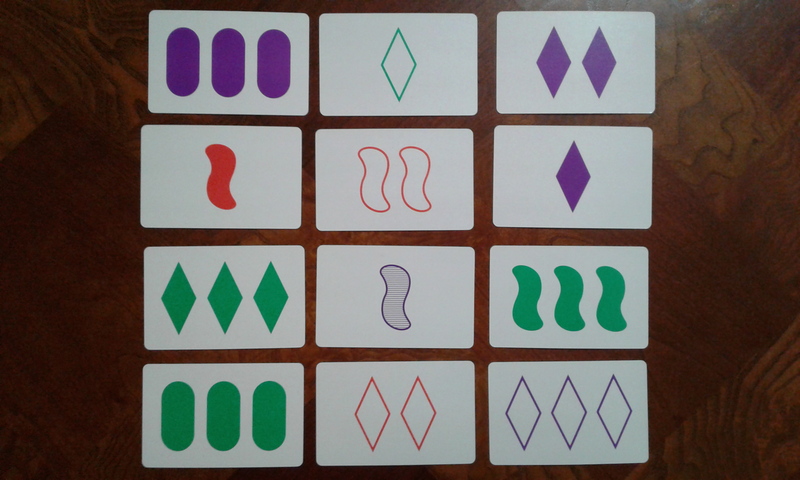 Each card’s shape is solidly filled in, unfilled, or shaded. At the game’s start the deck is shuffled, and twelve cards are laid face-up in the center of the table in a 3×4 grid. Once all of the cards are laid out, those who are playing examine the grid for potential sets. A set is defined as a group of three cards anywhere within the grid that all either share a similar or completely distinct characteristic for each classification of shape, shading, color, or number of items on the cards. Once a player is sure they see a set, they call out that they’ve found one to everyone else playing. They then pick out the three cards and all other players confirm whether a set has actually been found or not. If a set has indeed been found, the player who found the set keeps those cards and a point is added to their score. Three new cards are drawn from the deck and are used to fill in the places where the cards used to make the set were taken. If a valid set was not confirmed to be found, the player who claimed a set has their score decremented by one set. Play then continues with all players looking for the next set. Play ends and scores are tallied when the deck runs out of cards. Whoever found the most sets becomes the winner of the game. It is important that all players understand exactly what a set is before play begins. I was mad as a hen when I was picking what I thought were sets and losing points the first time I played Set. Meanwhile my opponent was selecting out sets that I had disregarded because I thought they did not fit the description of a set. An example of a set is shown where there are three solid green ovals, three solid green squiggles, and three solid green diamonds. 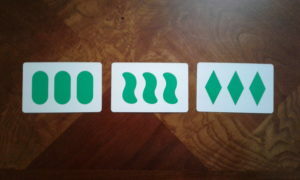 These constitute a set because they are all green, there are three shapes on each card, the shapes on each card are all solid, and a distinctly different shape is displayed on each card. This is a valid set. 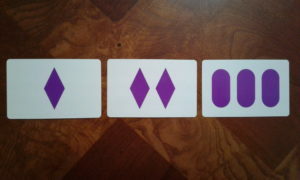 An example of a group of three cards that is not a set is also shown here. 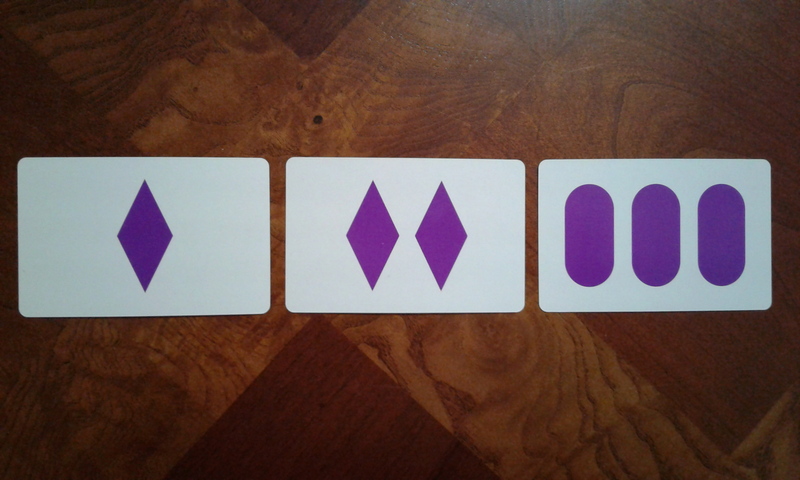 While all three cards are colored purple, each card has a distinct number of shapes, and all of the shapes shown are solid, two of the cards display diamond while the final card is oval. 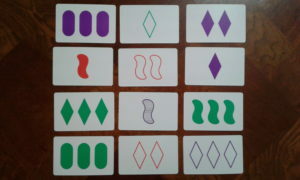 Because not all of the cards contain diamond nor does each card contain a distinct shape, these cards do not constitute a set. This is not a valid set. One final example of a set is shown here. The color is different on each card: red, green, then purple. 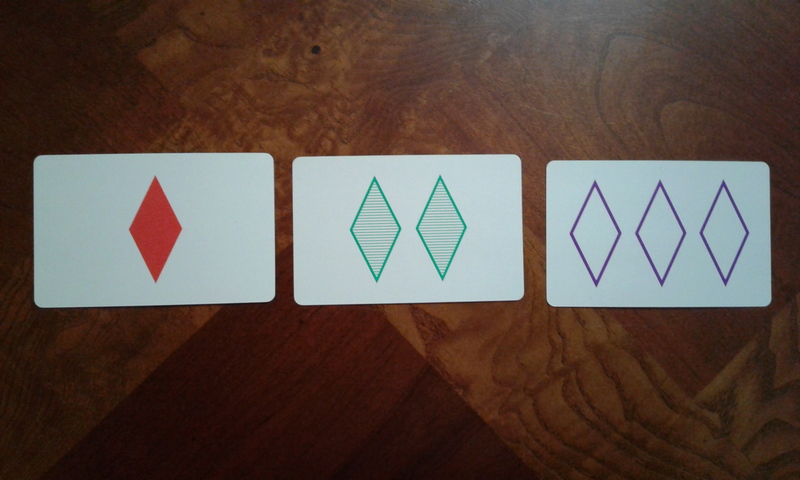 Each card contains diamonds, but each one has a different number of diamonds. The diamonds have distinct shading across all cards. The first is solid, the second shaded, and the third empty. This is a valid set. If at any point no set is found within the grid on the table, then three additional cards are pulled from the deck and placed into the grid for a total of 15 cards. Play then continues. When the next set is discovered, no further cards are drawn in order to get the grid back down to twelve cards. Therefore, as I understand it, there should never be more than 15 cards in play at a time. In solitaire play, a player is trying to find as many sets as they can to beat their previous score. When they are unable to find a set in the twelve card grid, they may add the additional three cards, but doing so creates a one set penalty to their score. Of course, who is going to know you’re cheating if you’re playing alone? 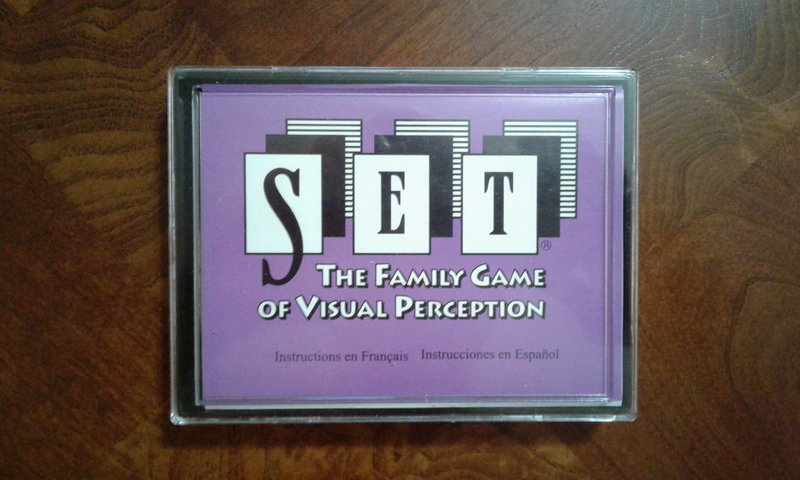 Set is a fun little card game that is easy to learn how to play. Given that any number of players may play it, it is an ideal card game for party situations. It has won several game awards including the MENSA Select award. I can vouch that this is a fantastic title that belongs in any serious card gamer’s collection.